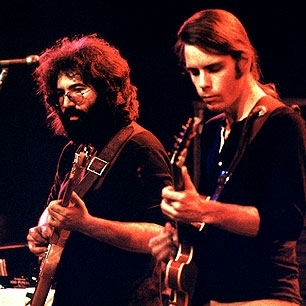 Garcia+Weir, 1972-San Franciscans in the UK. personally would've liked to hear those songs on an album of their own." Well, were I in charge of such things, I'd have compiled the very album you'll see at the bottom of this post. In fact, I think that Rhino, or whoever is putting official Dead stuff out, should do just that. However, I believe that my idea would end up in the same round, metal "suggestion box" with the foot-operated pedal, that my Nesmith in Nashville idea ended up in. I think, in many ways, were it released at the time, Ramble On Rose would be considered the perfect west coast American counterpart to The Rolling Stones' Exile on Main Street. What Exile was to claustrophobic, cynical, Jack Daniels n' junk, Euro Decadence, Ramble On Rose should have been to wide open, wild west, coke and acid, American Idealism. There's a bit of an interesting correlation between The Stones and the Dead in 1972. Both were on creative and chemical highs, and both were touring outside their homelands. 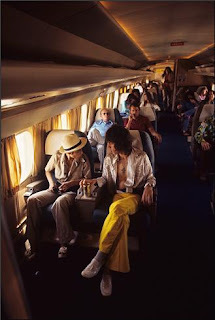 But, whereas The Stones tour was a money making machine, with Mick very conscious of who was and wasn't on the guestlist (he wanted to appear equally attractive to the men and women who made up the A-List of both the art and business world--Keith couldn't give a toss, as long as the "tour doctor" was well stocked at all times), The Grateful Dead, by their own admission, were, as a collective, One Big Dumb American Tourist. (or as Garcia stated to Charles Reich, a Yale law professor, and Jann Wenner of Rolling Stone, The Dead are "One Dumb Guy"). 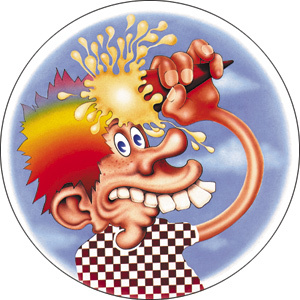 The Rainbow Kid on the cover of Europe '72 reflects how they saw themselves. Ugly, loud, attracting the wrong kind of attention. The cliche of how Europeans see American tourists. The people who elicited groans when fellow passengers were unlucky enough to have to sit near them on a transcontinental trip. This image was not exactly Truman Capote and Andy Warhol being seen on the Stones' private jet. Would you let your daughter date this kid? Would you kiss your mother with that mouth? And yet, if one was open-minded enough to start a conversation with one of this motley, hirsuite crew, depending on who they were next to, they would likely get quite an education. And not about the price of weed. 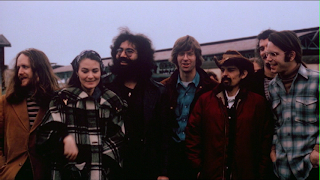 Phil Lesh was a walking classical, jazz and avant garde music textbook. And Garcia, judging from the many interviews with him that I've read, could expound upon just about anything. And not be bullshitting. They all might be high as kites, but...well, they're like that kid you know in college who takes acid before his advanced physics final and aces it. Then invents something for NASA. Or Apple. No wonder people hate them. Whether we're talking The Stones or The Dead, these were just cocky, talented, musicians in their mid to late 20's, expressing, in words and music, as well as attitude, what was written in their genetic codes, and selling it to the masses. They grew up in vastly different environments, but had the same influences. A chubby 15 year old anti-authoritarian named Jerry was practicing Chuck Berry licks in San Francisco at the same time as a big-eared, equally rebellious kid named Keith was doing the same in London. They were also practicing to be painters, but preferred the lack of pretentiousness in rock and roll. Making good on these teenage practice sessions, the two men, despite creating hundreds of classics on their own, never stopped showing off their Chuck Berry licks to crowds. "Johnny B. Goode", "Promised Land", "Let It Rock", "Run Rudolph, Run", and "Around and Around" were all covered by the Dead and "Around And Around", "Bye Bye Johnny", "Carol", "Sweet Little Sixteen" ,"Come On", "Down The Road A Piece", "Let It Rock", "Little Queenie", "Memphis, Tennessee" and "You Can't Catch Me" were all covered by The Stones. From bedroom to arena--compare/contrast the 20-something Keith and Jerry's Chuck Berry licks. Really, this is where the direct comparisons to these two bands begin and end. So I post these clips not as a "awwwwwesommmme" type thing. Just a compare/contrast thing. Close your eyes, pretend you've never heard of either band and you can't tell which band spent 2 hours in hair and makeup and which one is led by 2 guys who look like they've come to repair your roof.. They just sound like grown up rock and roll kids playing a song by one of their faves. The Grateful Dead--July 1971, "Johnny B. Goode"
So now to the subject at hand. I've compiled what I feel is an album akin to Workingman's Dead and American Beauty--one that qualifies as just good early 70's singer-songwriter pop rock. No jams, no overly ambitious jazz changes...not too wimpy, not too weird, not too lame. All substance. And, as I stated earlier, a sort of American answer to "Exile". 3) The Grateful Dead's Europe '72 (which had many great new songs alongside live oldies...but all the vocals were overdubbed in a studio, so these are almost like studio versions). It would have been a classic double album, with the only gimmick being the two short, arty Garcia instrumentals that would have begun side one of each album. And then there's the more transcendent, peaceful, Zen stuff ("The Wheel", "Cassidy", "Bird Song" (which is about Janis Joplin but works as a general statement). At the end, in "He's Gone", after describing a litany of horrible images, the loser figure sings the famous "nothing left to do but smile, smile, smile". (Yet another dark Robert Hunter line that becomes associated with the acid-eating grins of Deadheads mindlessly parroting the lines that look best out of context, on bumper stickers, and surrounded by roses). And to begin and end, party man Bob Weir rocks it up, screaming his pony tailed head off. 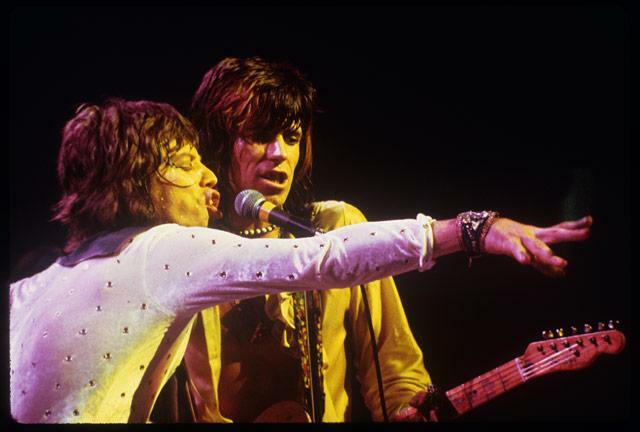 But even these songs are filled with resigned lines like "don't worry about tomorrow--lord, you'll know it when it comes"--which of course, was how these guys--and The Stones, and most big names of the time--were living. So here's the Spotify Link to the fictional, really-should've-been one of the best-selling, critically-acclaimed albums of 1972, RAMBLE ON, ROSE.